Hawaii’s bicyclists are considered drivers of vehicles. Bicyclists have most of the same rights and responsibilities as motorists. 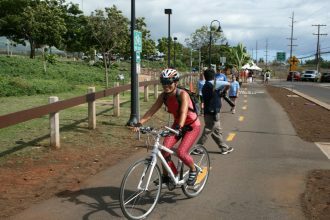 Learn more: check out Hawaii’s State Bicycling Laws. The County of Maui requires all bicycles that have two tandem wheels that are 20 inches or more in diameter and all mopeds to be registered. Bicycles with wheels less than 20 inches in diameter are not required to be registered but owners may register them to facilitate the return of a recovered stolen bicycle. The permanent registration fee is $15. More information. In Maui County, all juveniles under the age of 16 years old MUST wear helmets while riding a bicycle. Helmets are recommended for adults at all times but are not mandatory. Bicycle lights and bike reflectors are required by law for all riders at night including 30 minutes before and after sunset or sunrise. Accidents do happen to even the most careful cyclist. Since 75% of bicycle related deaths are due to head injuries, protecting your head is essential. Only purchase a helmet that meets Snell Memorial or ANSI standards. Today’s bike helmets are lightweight, colorful, well-ventilated and sleek, so vanity is no excuse for not wearing one. For maximum protection wear it properly, so that it fits snugly over your forehead. Learn more at helmets.org. Hawaii’s Law of the Splintered Paddle (first declared by King Kamehameha in 1797 and incorporated in our state constitution in 1978) states that everyone has the right to travel safely on Hawaii’s roads. In today’s context, this covers vulnerable users of the roads including people who walk, bike, and work on the roads. Bicycling is a healthy activity and helps to reduce vehicle traffic on our roads. We ask all motorists to operate with caution around bicycles. Remember that the bicyclist is someone’s auntie, uncle, mom, dad, grandparent or child. Some of our Maui County bicyclists are individuals traveling to work because they can’t afford a car, want to protect the environment, get exercise, be green, or save money. Let’s all be considerate of these vulnerable users of our community roads who are doing a lot to benefit our community by staying healthy and safe. Keep in mind that bicyclists are required to ride on the right side of the road in single file. A bicyclist is allowed to ride in the center of the travel lane when the lane is too narrow for both car and bicycle to travel safely side by side. This rules applies even when the bicycle is moving slower than traffic. Bicyclists should not be expected to move off the road whenever a car is behind them. It is legal for the bicyclist to remain in the lane, even if they are slowing down or impeding traffic. Maui Bicycling League encourages bicyclists to think courteously of other road users, including pulling over occasionally when traffic is backed up behind them (when it is safe and convenient to do so, at the discretion of the bicyclist). Motorists should pass bicycles with the same precautions used when passing other slower motorists. They should pass only in zones where there are no double yellow lines, and should wait until they can see that the oncoming lane is clear of approaching cars. The motorist should signal, then move cautiously into the oncoming lane (left of center) to pass the bicyclist. Motorists should give bicycles at least 3 feet of space between their vehicle and the bicycle. Let’s keep everyone safe! STIP stands for State Transportation Improvements Plan. It’s a document maintained by the State of Hawaii Department of Transportation that presents a short-term, four-year implementation program for federally-assisted surface transportation projects in Hawaii. It identifies the public transit, highway, bicycle, and pedestrian projects that will receive federal transportation funds in the near future. See the latest revisions to Hawaii’s State Transportation Improvements Plan (TIP) here. Report potholes, broken pavement and other issues on Maui County roads with the COM Connect app, The app also allows you to report community issues, as well as view, comment on and vote to fix problems submitted by your neighbors. You can even create your own “watch areas” to receive notifications about all issues reported in your community and follow the progress of all service requests – not just the ones you report. Always carry identification and your cell phone in case of emergencies. – STOP and remain as close to the accident scene as practical while remaining safe, except to notify police. – ASSIST or search for assistance for anyone who may be insured. – NOTIFY the police (dial 911). Follow their instructions. – GATHER INFORMATION, as much as possible. Information should include a description of the individuals and/or vehicles involved, including license plate numbers. Information such as name and address should be exchanged with any persons involved, including witnesses.